The ConCoord City Logistics Game is a six-player game designed as part of the ConCoord project. The project focuses on Consolidation and Coordination of urban freight distribution flows, that are currently fragmented. By consolidating these fragmented volume flows in City Hubs (or Urban Consolidation Centers), a physical space where freight can be delivered and bundled again for delivery in the urban area, urban distribution can be organized more efficient and sustainable. In practice it is a challenge to get all stakeholders on board to make use of such a city hub. Different stakeholders have different interests, and do not always oversee the impact their individual actions may have on the total picture of freight distribution flows in the city. 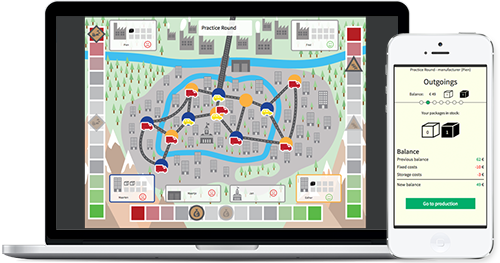 This city logistics game was designed to demonstrate these difficulties. It is meant as a tool to come to an understanding of the objectives and behavior of the different stakeholders in city logistics. It is also designed to experience the importance of communication between the stakeholders, to experience decision tradeoffs in transport operations and to learn how to interfere when things go wrong. Players of the game use their smartphone to perform their individual actions, and its consequences are depicted on the game board, which is displayed on a public screen. The game can be used in e.g. workshops as a tool to demonstrate the complexity of organizing city freight distribution and to evoke discussion about the challenges and benefits of consolidation and coordination in city logistics. To learn more about the rules, a demo PDF version of the player manual is available for download here (388 KB). If you are interested in playing the city logistics game, please click here to contact the administrator of the city logistics game. The administrator can provide you an access code to login.